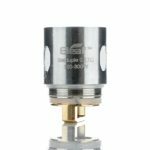 Melo 300 Sextuple Coil Subohm Tank is the first extreme performance orientated atomizer from Eleaf, capable of an absolutely staggering 300W maximum output. Building upon the classic Melo platform, the Melo 300 features a clean and universally compatible look and design. The marquee feature of the Melo 300 is the new Eleaf ES Sextuple Coil Structure, an extreme performance orientated wide body chassis design that is rated between 100 and 300W, allowing for exceptional maximum range. Each ES Sextuple Coil features a three coil section design with parallel vertical coils in each section, with an ohm rating of 0.17 ohms. 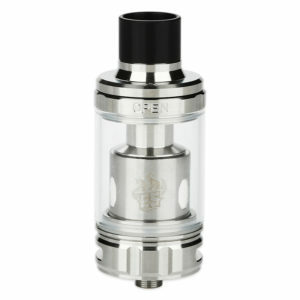 The ES is unique in it's full wicking design, allowing for greater maximum saturation as compared to other performance orientated coils. The Melo 300 editions measure 26mm in diameter and are filled via a retractable and sliding top fill system that exposes a single large fill port for convenience. Airflow feeds into this high performance atomizer through dual 13mm by 3mm airslots located at the base of the chassis providing ample airflow all the way up to the ES Sextuple Coil's 300W maximum. With a clean and simple design, an efficient top fill system, and incredibly capable coil structures, Eleaf's Melo 300 Sub-Ohm Tank brings unrelenting performance in an affordable platform.